Timing: The race starts from Burrowing Owl Estate Winery (500 Burrowing Owl Pl), with the first wave running at 7.45am, second wave at 8.25am, third wave at 9.10am. Runners will cross the finish line in Oliver Community Park between 11am and 3pm, during the Finish Line Party. The Winemaker Dinner in the Park starts at 6pm. Why: After being awarded Canada’s Event of the Year at the 2017 Canadian Tourism Awards, the Half Corked Marathon returns for its 10th anniversary on May 26th. 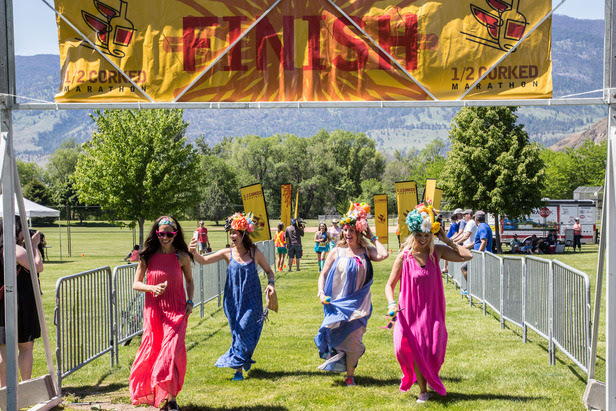 Departing from the start line at Burrowing Owl and weaving through the vineyards of Oliver Osoyoos Wine Country, the event will see 1,400 runners – many in elaborate costumes – enjoying the 18km scenic route and 18 winery stations along the way. The Half Corked Marathon ends with the Party at the Finish Line, where all 41-member wineries will offer wine tastings, alongside food trucks, live music and more. Everyone is welcome to join, and wine tasting packages are available from $25. To toast the 10th anniversary of the Half Corked Marathon, the Winemaker Dinner in the Park will offer the opportunity to dine with some of the region’s most celebrated winemakers in intimate surrounds. Following the run, Oliver Community Park will transform into a beautiful dining venue for a long-table winemaker dinner, catered by Chef Derek Ulhemann of Piggy’s BBQ, Oliver Eats and Vagabond Kitchen. Media access: If you are planning to attend to cover the event, please contact Marisa Cuglietta (marisa@hawksworth.ca / 778.987.3707) for more details. For visual footage of the 2017 race, please click here.